Antique stickpins are miniature works of sculpture set atop gleaming columns of gold. In the early 1900s and late 1800s, fine stickpins were created in a nearly limitless variety of imaginative designs, styles and motifs. They are an elegant testament to the inspired imaginations, unexcelled craftsmanship and elegance of the past. Brassler Scarab Hans Brassler's imaginative interpretation of a winged scarab finely executed in bloodstone and gold. The oval bloodstone forms the body of the scarab while the goldwork creates backward sweeping wings. Crafted in 14kt gold, circa 1910. Brassler Jade II A nephrite jade glows with the dark green of the forest undergrowth in a golden setting of laurel leaves and tightly scrolled corners. 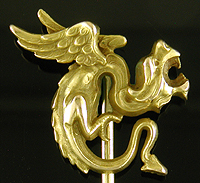 An elegant stickpin created by Hans Brassler in 14kt gold, circa 1910. Lapis Lazuli Intensely blue lapis lazuli sparkles with golden accents beneath flowing Art Nouveau curves and classically inspired laurel wreath borders. A wonderful example of the elegant, finely sculpted jewels created by Hans Brassler. Crafted in 14kt gold, circa 1910. Sapphire Geometry The intertwining, angular lines of a golden interlace cradle a bright blue sapphire and small sparking diamond. A nice example of the elegant geometry of Art Deco design. Crafted in 14kt gold, circa 1920. The Equestrian Beautifully designed stickpin of an energetic, alert horse. A small red stone (likely a garnet) is set in the eye. Crafted in 14kt gold, circa 1925. Below are several of the stickpins that have recently sold. The Philosopher A monkey contemplates a small pearl while nonchalantly scratching his back. The Victorians loved jewels with hidden messages and secret meanings. This beautifully sculpted stickpin offers a lesson in humility. Crafted in 14kt gold, circa 1900. Border Collie A vigilant border collie watches from within a Victorian reverse intaglio. The pooch is beautifully sculpted with a finely detailed coat, whiskers and soulful eyes. Crafted in 18kt gold, circa 1880. La Chimere II A French chimera hungrily pursues a small golden ball. This fierce gargoyle has the head of a an eagle and body of a serpent that morphs into a vine decorated with acanthus leaves. Crafted in 18kt gold, circa 1900. Amethyst and Diamond A rich purple amethyst rests between rising volutes accented with laurel leaves. Beneath the laurel wreath a small diamond sparkles. Created by Hans Brassler in 14kt gold, circa 1910. Burgees Aloft An elegant nautical stickpin featuring the burgee of the New York Yacht Club and the commodore's flag in a beautifully carved reverse intaglio. Created by Carrington & Company in 14kt gold, circa 1900. Serpent and Diamond An inquisitive serpent slithers up a golden post seeking a sparkling diamond. The serpent is wonderfully rendered with an expressive face and sinuous, twisting body. Crafted in 14kt gold, circa 1900. Sapphire and Pearl Entwining Art Nouveau curves cradle a luminous pearl and bright blue sapphire. The flowing curves come together beneath the sapphire to create an open heart. Crafted in 14kt gold, circa 1900. Pearls of Wisdom A wise owl perched on a branch with a freshwater baroque pearl. Note the rich details of the owl's feathers and head. Two small rose-cut diamonds are set as eyes. Beautifully crafted in 14kt gold, circa 1890. Carter Moss Agate An elegant Art Deco stickpin featuring a striking Moss Agate set in an eight-sided white gold bezel. Created by Carter, Gough, a maker of fine stickpins, cufflinks and other jewels, in 14kt white gold, circa 1920. 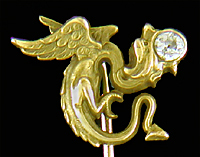 The Flyin' Lion This Victorian stickpin features a winged lion cradled in a curved horn-like object. A small pearl is set in front of the lion. Wonderfully crafted in 15kt gold. L'Art Nouveau A beautifully sculpted stickpin of a serenely watchful woman with wild, flowing hair. A small pearl is set in the lower tresses. Crafted in 14kt gold, circa 1900. Lucky Clover A beautiful four-leaf clover sure to bring luck to the wearer. A small pearl is set in the center like a morning dew drop. Crafted in 14kt gold, circa 1900. Estate Jewelry Galleries Several galleries of beautiful jewels from the Victorian, Art Nouveau, Edwardian and Art Deco eras. Everything from flowing Art Nouveau brooches to dramatic Art Deco cufflinks. Antique Cufflink Gallery A collection of striking cufflinks from the Golden (and Platinum) Age of cufflinks - 1880 to 1950. Here you will find elegant cufflinks from the late Victorian to the jazzy Art Deco era. Antique Brooch and Pin Gallery A gallery of beautiful brooches and pins from the Victorian, Art Nouveau, Edwardian and Art Deco eras. Antique Dress Set Gallery Elegant dress and tuxedo sets from the Edwardian and Art Deco periods. During this era fine dress sets wedding elegant design with masterful craftsmanship were created. when new pieces are added to the gallery.